Originally bred for hunting foxes and hares, the Harrier dog breed is a lively companion with excellent hunting skills. While their history is still unclear, many believe that Harriers were a descendant of the bloodhounds from France or Belgium. However, the first records of the actual Harrier breed were in England almost 800 years ago. Throughout history, harriers never gained very much success in their popularity. Part of this is due to the fact that this breed wasn’t a common household pet but instead belonged to many hunting groups. Even with their small popularity, they were still recognized by the American Kennel Club by 1885. Independent, hardworking, and loving are the main characteristics of the Harrier breed. Just like any other pack hound, these dogs love a job to do, and need to be mentally stimulated on a daily basis. They can have a mind of their own, becoming stubborn if they don’t feel like doing something they are asked to do. At the end of the day, Harriers are very easy going and love to be in a family setting. As long as an experienced owner can handle their stubborn qualities than the harrier will be an excellent companion for years to come. As said above, Harriers are known to be independent, which can make training efforts a challenge. That’s why it is crucial to start the training process as early on as possible. The best method to follow when training these dogs are to use positive reinforcement and consistent practices. Also socialize them with different people, places, experiences, and sounds while they are still a puppy. This will make sure they learn how to be a well-mannered household pet later on in life. If you are still having troubles training your dog, try enrolling him in a puppy training and obedience course. Harriers crave an open yard to roam and run freely. That’s why it’s important that they get plenty of physical activity on a daily basis. 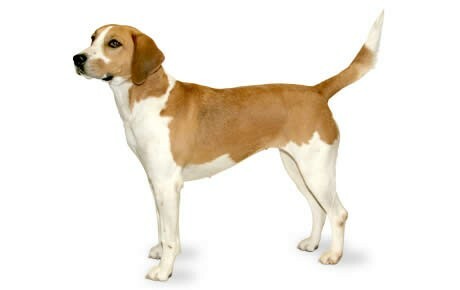 Just like with most hound breeds, the Harrier is easily bored if they are not getting enough play time. When this happens, your pup may turn destructive and develop naughty behavior. Prevent this from happening by taking your Harrier on long daily walks. On average, the Harrier lifespan is between 12 to 14 years. Even today, the Harrier is not a popular breed in America. This year, the AKC has ranked Harriers as the 186th most popular breed out of 202 registered dogs in the United States. For optimal health, Harriers should consume between 1.5 to 2 cups of high-quality food, split into two separate meals. However, keep in mind that this depends on their size, age, metabolism, and activity level. For a more specific feeding regimen for your Harrier, consult with your veterinarian. All the Harrier needs is a weekly brushing to keep their coat in great condition. This will free their coat free of any debris while also reducing their moderate shedding. Along with their coat grooming, be sure to brush their teeth on a regular basis to reduce their risk of dental disease. Lastly, trim their nails every couple of weeks. As a rule of thumb, if you can hear your dog’s nails tapping on the hardwood floor, that means it’s time for a trim! Are Harriers Good With Kids? Their loving and energetic personalities pair perfectly with children. Whenever a child and pet are together, it is always advised to have a parent present. Make sure both the dog and child understand how to interact with one another so they can have a positive and safe relationship. Hip dysplasia: One of the most common health issues that affect larger breeds is hip dysplasia in dogs. This hereditary problem occurs when the hip socket and thighbone do not properly fit together, causing the joints to grind and rub against each other. When this happens, the dog may experience pain, lameness, and eventually arthritis. Epilepsy: Canine epilepsy is the number one cause of seizures in dogs. This neurological disorder is thought to come from toxins, trauma, genetic abnormalities, or tumors. While there is no known cure for epilepsy, there are many treatment methods to reduce the symptoms. I want to thank Canna-Pet for such amazing products, Sunny was having at least one grand mal seizure a month, sometimes more (on traditional seizure meds).